So you saw the scarf I made for my bestie, but I needed to make more! I had picked up some gold plated wire recently and was waiting for the perfect project for it. This will work for short names and words and they are so easy and so nice! 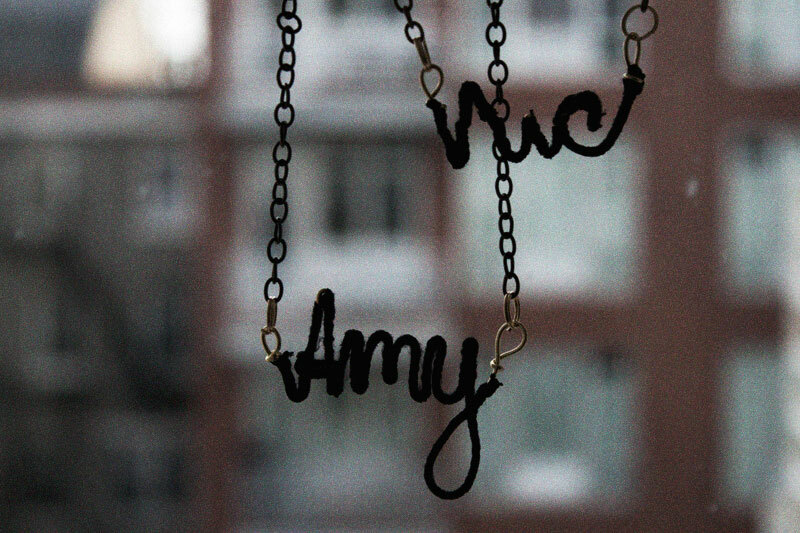 When I showed my roommate Nic that I was making one for Amy, she said she wanted one too! Two gifts in one shot, I'll take it! • 20 gauge wire (doesn't have to be gold plated, and can be another weight, but I wouldn't recommend anything less than 20, it will be too light to hold). 1 / Cut your wire to your desired length. Mine was about 5 inches long for a 3-letter word (Amy required a bit more than Nic). This was a guesstimate. I'm not going to lie to you, I began without a plan and ran out of wire, had to straighten it out and start again. 2 / Using your pliers, make a loop at both ends of the wire. 3 / Tie one end of the string right below the loop in the wire. Wrap the string around and around and around the wire, very tightly, until you reach the end of your wire. 5 / Attach your jumprings to both or the loops you made in the wire and attach the chain. To cross the "A" in Amy I just couldn't figure out how to bend the wire in a way I liked! The solution you ask?.... I wrapped a jumpring in thread and slid it over the A. Ta- Da! They loved them! You could do initials, words (like LOVE, HOPE....) or names. This is such a versatile project, you can make them for so many people (and possibly a bracelet or ring!) and in whatever color you want! Who are you going to make it for?